Since smoking has been forbidden on aircraft, the air exchange has been greatly reduced to save both fuel and free choice - for our own good! Airliner Cabin Environment: Contaminant Measurements, Health Risks, and Mitigation Options - One must fly 48,440 hours non-stop to inhale the equivalent of one cigarette, and cosmic radiations are 507 times more dangerous than passive smoke. But smoking is forbidden. May 1, 2006 - This list's title may sound sarcastic, but it is scientifically accurate. The exposure of the subjects through passive smoke through the years cannot be measured. Inevitably, under the authority of the institutions who conduct them as well as those who provide the funding, these studies rely upon vague and non-verifiable memories, the ONLY basis upon which the imprimatur of "scientific evidence" on the harm of passive smoke rests. Throughout the world laws "protecting" nonsmokers from passive smoke are justified based on the conclusions of these studies. Rather than separating smokers from nonsmokers and keep equal access rights for both, prohibition is used to promote intolerance and social engineering in order to further the financial agenda of certain multi-national pharmaceutical corporations, resulting in negative consequences for national economies, liberty and social coexistence. Upon this statistical trash very many other "dangers" are based, each requiring expensive regulation. This list undoes the myth circulated by anti-tobacco operatives that passive smoke studies not reaching the conclusion that secondhand smoke is harmful are produced by researchers who are paid off by the tobacco industry. The studies on this list include financing sources as well as information on the authors. The list is not selective but complete. Risk spans and average risks are included as well. Each study can be downloaded in its entirety in PDF format. Please note that none of these studies indicates that passive smoke is a significant risk factor, falling far below the 200% [RR=3], which is considered the threshold of significance for the existence of a risk by serious epidemiology. Note also that only one of these studies on passive smoke and lung cancer was financed by the tobacco industry. PLEASE NOTE that this list consists of 75 studies. 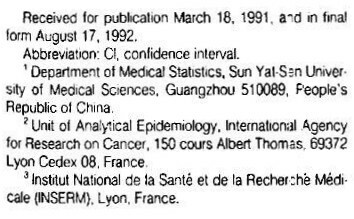 However, in another list published on our site about 150 passive smoke and lung cancer studies are listed. This is not a discrepancy. Since a study can examine risks for different categories, it can report, for example, a risk for exposure at home and on the work place as well. Another risk category could be exposure to passive smoke as children. Therefore the same study can have a multitude of results, explaining why in the comprehensive list there are so many more indications. Finally, a good part of the studies differentiates the risk for males and females, further inflating the number of permutations. DOWNLOAD ALL THE STUDIES ON PASSIVE SMOKE AND LUNG CANCER [PDF FORMAT] IN ONE ZIP FILE [39 Mb] AND SAVE DOWNLOADING TIME. To facilitate reading and indexing the studies, we offer the option of downloading this page in the printer-friendly PDF format. All hot links are preserved in the PDF format. Average Risk Here is recorded the average risk of the study expressed in RR [Relative Risk] and its extremes of variation [example: RR= 1.52 (1.0-2.5)], followed by hot link to the authority that has established the average risk [example: from USEPA 1992, Table 5-5]. Memory rule: RR=2 means 100% risk elevation, RR=3 means 200% and so on. Thus, RR=1.52 means 52% risk elevation. The minimum risk elevation which, according to epidemiology, is necessary to seriously consider that the risk elevation is due the examined factor is over 200% or RR=3. Downloadable Click here to download. When this link is hot it is possible to download the entire original study in PDF format. Comments In this area comments and notes concerning the study are reported when necessary. Authors Akiba, S.; Kato, H.; Blot, W.J. Authors Boffetta P, Aguado A, Ahrens W, Benhamou E, Benhamou S, Darby SC, et al. 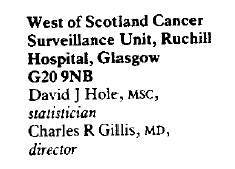 Published by J Natl Cancer Inst., 1998;90(19):1440-50. Ministry for Education, Science, Research and Technology (grant 01 HK 546) and the Federal Ministry of Work and Social Affairs (IIIb 7-27/13); in Germany 2, the Federal Office of Radiation Protection, Salzgitter (St Sch 1066, 4047, 4074/1); in Germany 3, the Federal Office of Radiation Protection, Salzgitter (St Sch 4006, 4112); in Italy 1, MURST, the Italian Association for Cancer Research (AIRC), Regione Piemonte-Ricerca Finalizzata and Special Project "Oncology" Compagnia San Paolo/FIRMS; in Italy 2, the National Research Council (91.00327.CT04) and the Italian Association for Cancer Research; in Portugal 2, Comissa˜o de Fomento de Investigac¸a˜o em Cuidados de Sau´de; in Spain, the Spanish Ministry of Health (reference 89002300); in Sweden, the Swedish Match (8913/9004/9109/9217) and the Swedish Environmental Protection Agency (5330071-1); and in the United Kingdom, the Imperial Cancer Research Fund, the Department of Health, the Department of the Environment and the European Commission. Authors Brownson RC, Alavanja MC, Hock ET, Loy TS. 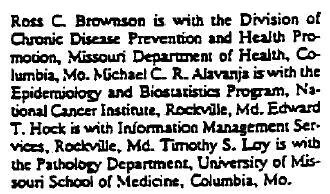 Authors Brownson, R.C. ; Reif, J.S. ; Keefe, T.J.; Ferguson, S.W. ; Pritzl, J.A. Authors Buffler, P.A. ; Pickle, L.W. ; Mason, T.J.; Contant, C.
Comments This study is a dissertation and it has not been peer reviewed. Authors Cardenas V, et al. Authors Chan, W.C.; Fung, S.C. Authors Chan-Yeung M, Koo LC, Ho JC-M, Tsang KW-T, Chau W-S, Chiu S-W, Ip MS-M, Lam WK. Authors Correa, P.; Fontham, E.; Pickle, L.; Lin, Y.; Haenszel, W.
Authors Dalager NA, Pickle LW, Mason TJ, Correa P, Fontham E, Stemhagen A, Buffler, P.A. ; Ziegler, R.G. ; Fraumeni, J.F. Comments Authors reported in USEPA 92 as: Buffler, P.A. ; Ziegler, R.G. ; Fraumeni, J.F. Authors de Andrade M, Ebbert JO, Wampfler JA, et al. Financed by "We wish to thank additional contributors Drs. Claude Deschamps, Eric Edell, James Jett, Marie Christine Aubry, Mark Allen, and Julian Molina for their valuable input at various stages of this research project. We also thank Ms. Susan Ernst for her technical assistance with the manuscript. This work was supported in part by the National Institutes of Health Grants CA 77118 (Yang), CA 80127 (Yang), R01 CA 84354 (Yang), and R25 CA92049 (Ebbert)." Authors Du Y, Cha Q, Chen X, Chen Y, Huang L, Feng Z, et al. Average Risk See study 13 below. Comments This study is combined with number 13 below. Average Risk RR= 0.75 (0.42-1.35) from the abstract of the study. Comments The whole study, costing several million dollars, was financed by state funding and funds from the American Cancer Society, except for the last $75,000 needed for the compilation of the data. The money was denied when it became clear that the study would not have produced the "right" results and demonstrated that passive smoke was a danger. For that reasons, the two Authors were forced to turn to the Center for Indoor Air Research, financed by the tobacco industry, to complete the study. Using that as an excuse, all scientific journals refused to publish this important study except the British Medical Journal, which was crucified by the antismoking establishment, which has an obvious and huge interest in falsely representing passive smoke as a public danger. This study demonstrates conclusively that exposure to passive smoke cannot be measured. Study Title Environmental tobacco smoke and lung cancer in nonsmoking women. A multicenter study. Authors Fontham ET, Correa P, Reynolds P, Wu-Williams A, Buffler PA, Greenberg RS, et al. Authors Fontham, E.T.H. ; Correa, P.; Wu-Williams, A.; Reynolds, P.; Greenberg, R.S. ; Buffler, P.A. ; Chen, V.W. ; Boyd, P.; Alterman, T.; Austin, D.F. ; Liff, J.; Greenberg, S.D. Authors Gao, Y.; Blot, W.J. ; Zheng, W.; Ershow, A.G.; Hsu, C.W. ; Levin, L.I. ; Zhang, R.; Fraumeni, J.F. Authors Geng, G.; Liang, Z.H. ; Zhang, G.L. Authors Hole, D.J; Gillis, C.R. ; Chopra, C.; Hawthorne, V.M. Authors Humble, C.G. ; Samet, J.M. ; Pathak, D.R. Authors Inoue, R.; Hirayama, T.
Authors Janerich, D.T. ; Thompson, W.D. ; Varela, L.R. ; et al. Authors Kabat G, Stellman SD, Wynder EL. Authors Kalandidi, A.; Katsouyanni, K.; Voropoulou, N.; et al. Authors Katada, H.; Mikami, R.; Konishi, M.; Koyama, Y.; Narita, N.
Average Risk RR= click here and see comments. Comments Study written in Japanese. The USEPA 1992 Reports mentions the study but does not report the RR value.. Authors Ko YC, et al. Authors Koo, L.C., Ho, J.H. ; Saw, D.; Ho, C.Y. Authors Kubic A, Zatloukal P, Boyle P, Robertson C, Gandini S, Tomasek L, Gray N, Havel L.
Authors Lam, T.H. ; Kung, I.T.M. ; Wong, C.M. ; Lam, W.K. ; Kleevens, J.W.L. ; Saw, D.; Hsu, C.; Seneviratne, S.; Lam, S.Y. ; Lo, K.K. ; Chan, W.C. Comments The study is a dissertation and it has not been peer reviewed. Authors Lee C, Ko Y, Goggins W, Huang J, Huang M, Kao E, et al. Average Risk RR= 2.2 (1.5-3.3) from CALEPA 2004, Table 7.2B. Authors Lee, P.N. ; Chamberlain, J.; Alderson, M.R. Authors Liu, Z.; He, X.; Chapman, R.S. Authors Liu Q, Saasco AJ, Riboli E, Xuan Hu M.
Authors McGhee SM, Ho SY, Schooling M, Ho LM, Thomas GN, Hedley AJ, Mak KJ, Peto R, Lam TH. Hong Kong Health Services Research Committee (631012) and Hong Kong Council on Smoking and Health. Authors Nishino Y, Tsubono Y, Tsuji I, Komatsu S, Kanemura S, Nakatsuka H, et al. Study Title Environmental tobacco smoke and lung cancer in nonsmokers: does time since exposure play a role? 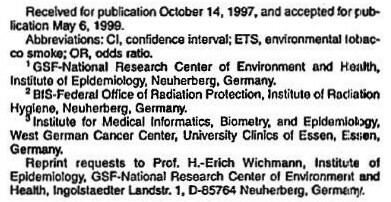 Authors Pershagen, G.; Hrubec, Z.; Svensson, C.
Published by Lung Cancer, 2002;35(2):129-36. Authors Sasco AJ, Merrill RM, Dari J, Benhaim-Luzon V, Carriot F, Cann CI, Burial M.
Authors Shen XB, Wang GX, Zhou BS. Authors Shimizu, H.; Morishita, M.; Mizuno, K.; Masuda, T.; Ogura, Y.; Santo, M.; Nishimura, M.; Kunishima, K.; Karasawa, K.; Nishiwaki, K.; Yamamoto, M.; Hisamichi, S.; Tominaga, S.
Average Risk RR= 1.6 (0.8-3.0) from CALEPA 1997, Table 7.5. Authors Svensson, C.; Pershagen, G.; Klominek, J. Average Risk RR= 0.86 (0.45-1.65), as reported in the abstract for non smoking women exposed to the spouse for over 35 years. Financed by The funding is not declared in the abstract. Comments The funding is not declared in the abstract. Authors Trichopoulos D, et al. Financed by European Community (5th Framework Programme) (grant QLK4-CT-1999-00927), Compagnia di San Paolo, Europe Against Cancer Programme of the European Commission (SANCO), Deutsche Krebshilfe, Deutsches Krebsforschungszentrum, German Federal Ministry of Education and Research, Danish Cancer Society, Health Research Fund (FIS) of the Spanish Ministry of Health, Spanish Regional Governments of Andalucia, Asturia, Basque Country, Murcia, and Navarra, Cancer Research UK, Medical Research Council, Stroke Association, British Heart Foundation, Department of Health, Food Standards Agency, Wellcome Trust, Greek Ministry of Health, Greek Ministry of Education, Italian Association for Research on Cancer (AIRC), Italian National Research Council, Dutch Ministry of Public Health, Welfare and Sports, World Cancer Research Fund, Swedish Cancer Society, Swedish Scientific Council, Regional Government of Skåne, Sweden, Norwegian Cancer Society, Research Council of Norway. 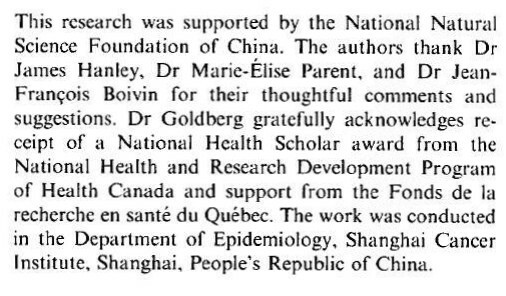 Authors Wang SY, et al. Authors Wang TJ, et al. Authors Wu-Williams A, et al. Authors Zaridze D, et al. Authors Zhou BS, Wang TJ, Guan P, Wu J.